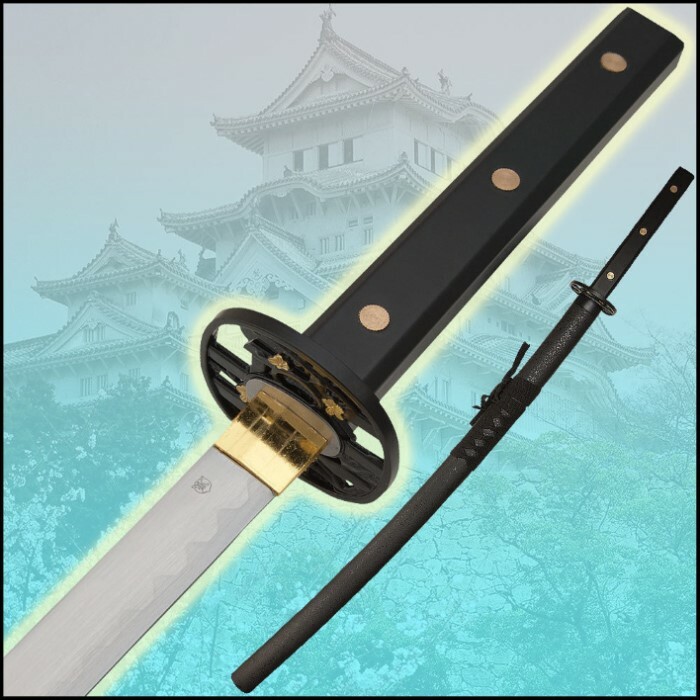 This traditionally designed katana sword is sleek and elegant. It features a stainless steel blade with attractive forging patterns. The impact-resistant ABS handle scales encase the tang and feature brass tang rivets. A brass habaki and custom-designed tsuba complete the elegant design of this katana sword. A matching scabbard with cord wrappings houses the 27-1/2" blade. 36" overall. bought one of these. its not full tang. tang is 2.5 inches long, blade is glued into a wooden handle. rivets are all fake. spent 2 hours modifying it to have a real full tang. which shortened the sword by 5.5 inches. false advertising. As a new collector I think this blade is not that bad. 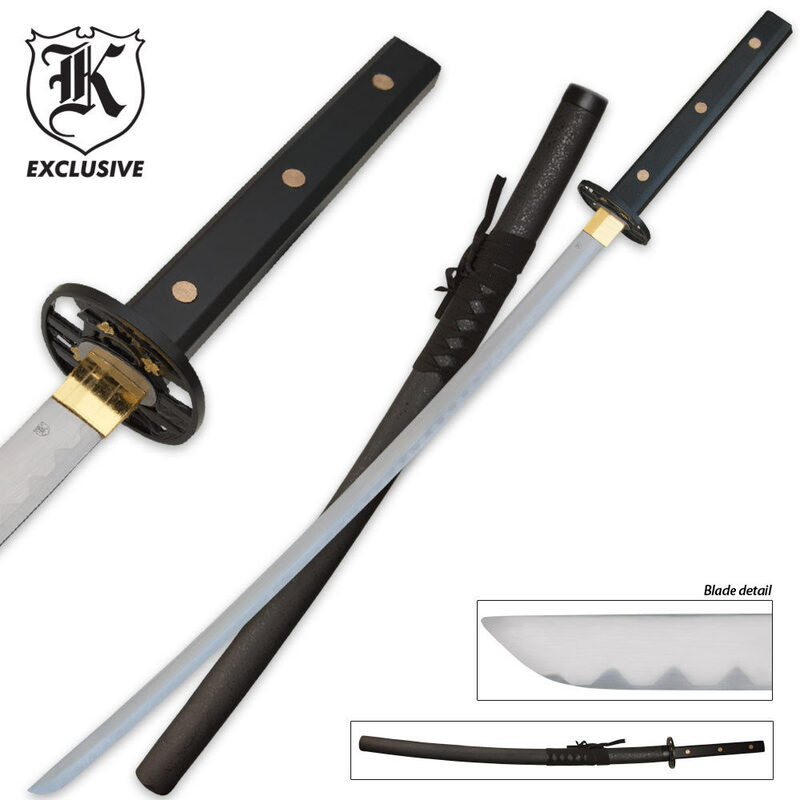 The price is $29.99 so don't expect some intense katana that you can cut anything with. It works great for wall hanging and I have used it few times to cut fruits and it works great. Definitely worth the buy! Very nice for price. Handle is cheap and mine had many boils and glue where rivets went into tang. Very Satisfied. Got two of these and the only downside is they arn't as sharp as I expected, but that can be fixed. Definitely worth it. for the price you can't beat this sword, it's full tang and sturdy with a great flexable blade...it does need to be sharpened when you get it but that's ok because I prefere to sharpen my own blades anyway...my only complaint is the guard is a bit loose, but with a hammer and my anvil I was able to tighten it right up! My complaints are about the handle, other than that, this sword is pretty pretty decent concerning the blade and scabbard. The pins weren't flush with the sides of the handle and the guard was very loose. My plan all around was to break off the handle and build my own if it was in question on its integrity, so it looks like I'll definitely be making a new handle. As for the blade, I'm pretty impressed. It seems to be made of pretty nice steel. For 30 bucks though, this makes the perfect sword for one who likes to customize their weapons. This sword is one of my favorites in my collection, right out of the box it felt sturdy and strong and definetly sharp, I liked it a lot, it will cut through almost anything if given a proper edge. Only used it once and broke the d**n handle off. When it got here the supposed brass pins were just fittings and half of them were rattling around in the box. I plan on turning it into a sturdier wakizashi. So no loss there. The blade is good but the assembly is lacking. This sword is a sound blade over all. The rivets stuck out a little but I wrapped the handle anyways. Since i can't see the metal run down the handle I assume it's not full tang. On the first day right out of the box i cut the bigger box it came in smoothly into two pieces. I practice bushido and this sword does fine for me to practice form and style with a live blade but wouldn't bring it to a real sword fight. It is definatly a weapon to be handled with respect.